Last week, the Pakistan Air Force and the Chinese People’s Liberation Army-Air Force (PLAAF) began joint training exercises dubbed “Shaheen VI” in China. The exercises began on Thursday and will run until September 27. According to Xinhua, China’s state news agency, a spokesperson for the PLAAF noted that China had sent a wide range of aerial assets and troops, including Shenyang J-11 twin-engine multirole fighters, Xian JH-7 fighter-bombers, KJ-200 airborne warning and control system (AWACS) aircraft, and surface-to-air missile crews and radar operators. 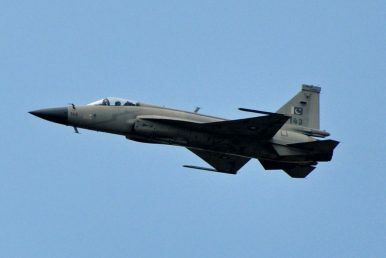 Xinhua added that Pakistan had sent an undisclosed number of JF-17 Thunder fighters and its own early warning aircraft—likely Pakistan’s Shaanxi ZDK-03 K. Eagle or Saab 200 Erieye—to the exercises. The JF-17 Thunder (known also as the FC-1 Xiaolong) single-engine, lightweight, multi-role fighter was co-developed by the Pakistan Aeronautical Complex and China’s Chengdu Aircraft Industry group. The Pakistan Air Force is the only current operator of the aircraft. The Shaheen series of exercises between the two countries, who are close partners, began in March 2011 and has since gone through five major iterations. Last year’s exercise, Shaheen V, ran through April. Pakistan and China have increased air force coordination in joint operations in the meantime. Increased aerial coordination between China and Pakistan could have a range of operational applications, ranging from counterterrorism operations against nonstate groups in China’s northeast to more complex operations during a potential future conflict with India.